McRae Williams on his way to the win at last year's Total Fight. 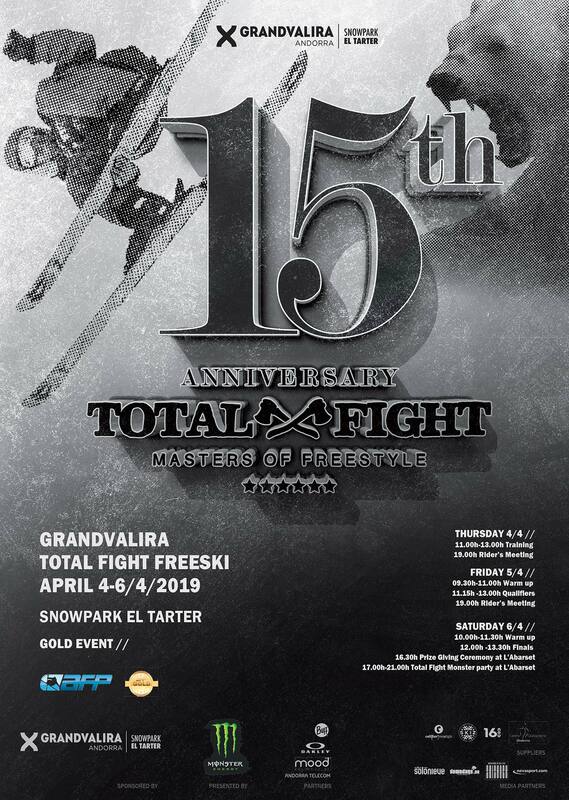 The Grandvalira Total Fight is coming up with a very special edition as it celebrates 15 years of history as one of the most important events of the international freestyle calendar. This season, Total Fight will be held from April 4-6, 2019. The World Tour will also be added to the celebration of the 15th anniversary of the Grandvalira Total Fight, and in freeskiing the event will be the last date of the year and end-of-season party for the AFP – Association of Freeskiing Professionals. Throughout these years, riders from all over the world have praised this slopestyle event. And to celebrate this special anniversary, the Grandvalira Total Fight is bringing together the best freeskiers of the discipline in the men’s category. The renowned El Tarter snowpark will be the place for a creative circuit consisting of a jumps and a jibbing section, which will be revealed in the coming weeks. Seriously though: what's up with these video editors and their music? Highlight clip from Total Fight 2018. Activity will begin on Thursday with the free practice session, the riders’ first contact with the slope course. On Friday there’s the qualifying session, and on Saturday the expected final. L’Abarset, the reference point for après-ski at Grandvalira and located at the base of El Tarter, will be the scene of the podium and closing party. The public can follow the competition with free access to the stands and also from the giant screen located in the snowpark. The competition will also be broadcast live on Saturday, April 6 on Grandvalira’s Facebook page. Here’s to a 15th edition of the Grandvalira Total Fight that will go down in history!